The Centers for Disease Control and Prevention recommend that healthy adults get at least 30 minutes of physical activity on a daily basis. Unfortunately, when you have trouble getting those 30 minutes every day, the recommendation often feels more like an insurmountable task. The CDC recommends walking as an excellent form of exercise, but if you tire quickly when just walking, it's time to explore some of the reasons why your body is fatiguing so soon and how to increase your aerobic endurance for daily fitness. Walking is one of the best, least injury-prone moves you can make toward better health. Your daily stroll is an effective aerobic activity because it raises your heart rate while having a low impact on your bones and joints. Regular aerobic exercise lowers your risks for cardiovascular disease, type 2 diabetes, obesity, balance problems and a host of other chronic conditions that diminish quality of life and can even affect your longevity. When you walk, you work the large muscle groups of the legs and feet -- you develop healthier, stronger quads, hamstrings, glutes, calves, feet and ankles, improve flexibility and boost circulation. A consistently sedentary lifestyle could leave you tired and fatigued after only a few minutes of walking. A variety of causes can contribute to your lack of aerobic endurance and all stem from the condition and efficiency of your heart. Being overweight places strain on the heart as it labors to pump blood through your body, reducing your endurance. Smokers usually have reduced endurance because they have reduced lung capacity and replace the oxygen in their blood with carbon monoxide, which is then pumped through the body. Even people who look physically fit can have low endurance if they don't exercise regularly, because their hearts aren't strengthened through workout and must labor to pump blood during the occasional aerobic workout, such as a brisk, long walk. If you feel tired after only a few minutes of walking, consider your lifestyle and how if affects your overall endurance. 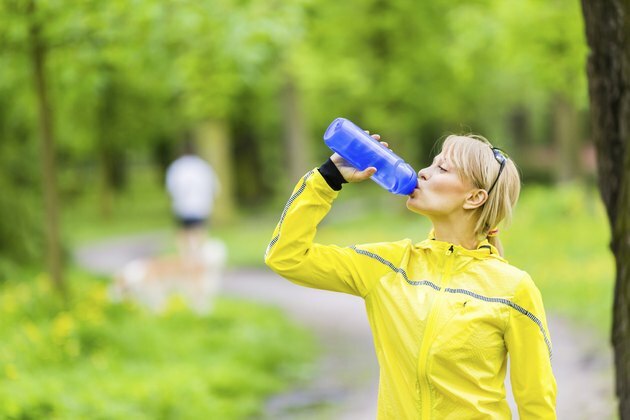 It helps to take a short break and rehydrate your body when you feel fatigued, since both dehydration and fatigue make it difficult to exercise. In the future, structure your walking so you're able to build up to longer distances by walking short distances on a daily basis, slowly increasing the amount of time you walk as your heart strengthens and your cardiovascular endurance improves. Start with several short walks each day to reach your 30 minutes, even if you can't manage it all at once. That fatigued feeling you experience while walking is preventable by making the proper choices. If you're a smoker, stop. Smoking reduces the amount of oxygen in your blood and even reduces the effect exercise has on your body. If you're overweight, schedule an appointment and talk to your doctor about beginning a weight-loss regimen, complete with daily exercise and a healthy diet. As you rectify your poor lifestyle choices, your heart will thank you with increased endurance so you're able to walk daily and fulfill your physical fitness requirements. And check in with your physician, if you experience severe exhaustion while walking, to eliminate any medical conditions that could be draining your energy.